Yep, Christian Voices are now preparing our next performance. The last book of the Old Testament gets the CV treatment. If you’re up for a lesson in Old Testament morals and perhaps how they could be applied today then you’ll be interested to know that we’re working on the teaching in Malachi. The book is intended for an Israel that was struggling to follow the Law of God and give due reverence to God. 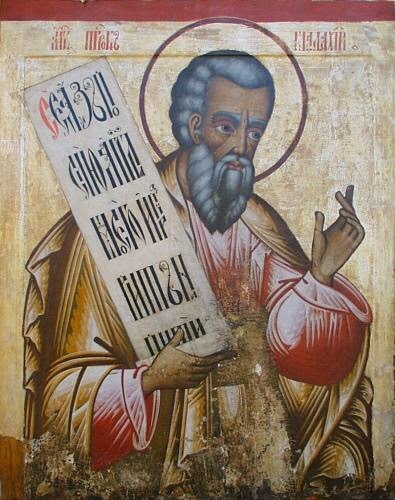 Malachi is normally depicted holding the Law of God and/or holding an arm out before him. Imploring the People of Israel to listen or beseeching The Lord on their behalf? What will you take away from our latest play “Malachi“? The play is written by Alan Young with songs from Dave Chamberlin and directed by Caroline Cox. More on the story to follow. Posted by harlekwinblog on 17/02/2015 in News, Performances and tagged News, Old Testament, Performances, Plays, Rehearsals.